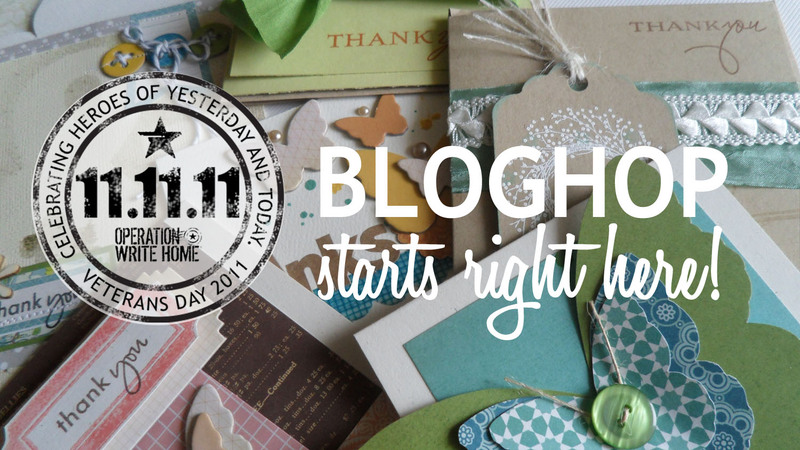 Welcome to the 11.11.11 bloghop – a crafty way to celebrate hereos of yesterday and today on the Veteran’s Day weekend! We make handmade cards to send to deployed heroes, so they can in turn write home to their families. It’s one small way we can serve them as they serve us – and by the notes they write back to us, they love writing on them as much as we enjoy making them! If you’d like to join us, visit our website and spend some time learning. We have guidelines (like no glitter, and making A2 sized cards); deadlines that are far in advance of holidays (ie Christmas season is finished already); and a great gallery full of ideas that show the kinds of cards our heroes really love! There are ideas to get your kids, churches, and other groups involved writing letters, ways to make donations and go shopping with discounts and buy products to benefit the cause. Our blogs are chock full of information too! This blog, Stars and Stamps, is our creative nerve center, where we post challenges, sketches, tutorials, and more to inspire you. The Homefront Blog reports what we’ve sent out (Mondays) and what’s come in (Thursdays) along with special projects. The Hero Blog hosts letters from our heroes – and is worth spending some time on! We recommend subscribing by email to get these posts sent right to your email so you know when something new is posted. So….enough about OWH, how about this bloghop? We have some fantastic corporate partners joining us for an exclusive hop for Veteran’s Day…they’ll be showing off some amazing cards (we’ve seen a few – and oh WOW!) and inspiring everyone with their posts. We are SO grateful to have such a quality roster listed below. You might see some candy along the way, so be sure to enter for it by leaving comments as directed! And be sure to read the posts, not just look at the pics…there’s a very special announcement slipped into one of these blogs! Without further ado….the bloghop! Go go go! Note that they might not link to each other, but should open in a new window so it’s easy to get back here for the next link! A PS to our participating corporate bloggers: I made a special card for you…it’s so little compared to all you’ve done….but know you are appreciated! Click here to see it. so many beautiful cards in this bloghop. I have seen lots of ideas. Beautiful stitching, shadow-stamping, great layouts. Thanks for all the ideas! What a great blog hop! My favorite card was the card with the shipping tag layered behind patterned paper. 🙂 Thanks for organizing this! There is so much inspiration going on the net today! And what an AMAZING cause to inspire it! But I have to admit – Ranger and Prima left me speechless! I think it is such a good idea to have a blog hop to spread the word about this worthy cause! TFS! Loved all the inspiration! I hadn't heard of Tonic Studios. Was fun to see all their lovelies!Copic and Sizzix wasn't up, so I will have to stop by later after work to view their cards.Thank you for hosting this swap! There is so much inspiration on this blog-hop that there is no way that I could pick just one. Know that your hard work and talents will be appreciated by the receivers of your cards. Thanks again for honoring our Military men and women and their families.Sandy and her group are the best! WOW … WOW … WOWI hopped once and I'll be back to bookmark and copy ideas for a looooooong time. The first run through is beautifully overwhelming. Am really enjoying, (selfishly) the inspirations of all these crafty ladies! Thank you for heading this up to send "Thanks" back to our cherished troops overseas and at home! Wow! These are amazing creations! I can't wait to run through this again when I have time to craft! Thank you for blog hop but mainly for the inspirational way to support those away fighting on our behalf. What wonderful inspiration in this blog hop! I saw so many beautiful cards and discovered Tonic Edgers. Where have I been?! My work day needs to be over FAST so I can come home and hop!!! I can't wait! Great hop, I'll be making some cards for your great cause, thanks for the inspiration. I commented on all except for copic as the post did not open properly. awesome…this is just so amazing… Love what you do…Thanks for sharing. What a fun hop that was! So much amazing inspiration! I was very inspired by the Prima and Studio Calico blogs! Thank you, OWH, for the wonderful way you support our troops!A note to Sandy; I LOVE the card you created for all the companies participating today – so cool! Just finished visiting all the blogs and am so inspired by all the beautiful and original card ideas! I think I'll spend this afternoon creating a few more cards now that I'm in creative mode!! !This blog hop to honor our heroes in a constructive way was such a great idea. Thank you Sandy, and to all the participants! What a fun blog hop! Lots of amazing techniques to try with stamps and inks! I can't wait to get some Copic markers to copy some of the lovely colorful designs as well! fun hop!!! i was gaspin fpr the prima creations, just awesome!! i comented in all but sizzix i would let me log in on my google acount. As an Army spouse, I was able to initiate a Cards for Troops event here at my Post. It is a great way to get spouses together to craft. THANK YOU for this! Thank you for putting this hop together. As a beginner it is helpful to see the companies and what they offer as well as pick up some tips and be inspired by their talent. Thank you for this wonderful hop. There are so many wonderful and inspiration cards to remember! The airbrush technique from Copic Markers seems so much fun, it really sticks out in my mind. Happy Veteran's Day! So many great cards today! Couldn't choose a favorite. Couldn't leave a comment of SRM Stickers. What fun I had hopping from one inspiring site to the next. Thank you for putting this together and calling attentionTo the wonderful work you do. Hats off! I enjoyed spending my morning blog hopping and found great inspiration on the Copic gallery (wish I had some to work with, maybe for the holidays). Anyway, enjoyed Basic Grey and Prima and Hero Arts of course. Love them all. To my grandfather who was in the Navy and to all that serve thank you! I did comment on all the blogs. The cards on the Prima blog were so amazing, but every blog had such amazing inspiration. I will definitely be checking out more of Tonic Studio's products. Such great edges and borders! The Copic technique is definitely one I will try. Congrats on the upcoming release!! Thanks for putting this together. It was was fun and inspirational! Keep up the amazing work. Sandy, Thank you for putting together such a great hop and for all the other hard work you do. I know the Heros appreciate by all the love they send home. Thank you to all the companies that provide all the eye candy for today. My inspiration jar runneth over. A few of the sights that caught my attention were Ranger, Tonic and Copic. Also, I can't wait to see what Hero Arts has dreamed up with the OWH stamps. Happy Veterans Day to ALL the Heros past and present!! What a fun blog hop! As an Army spouse, this was a special hop! Thank you for supporting our heros! These cards on this hop are amazing. I was impressed with the beauty and quality, thought and time that must have gone into making them. So grateful for each company. I am so thankful for our veterans and I'm so glad that I participated in the blog hop today. All of the blogs were so inspiring and I will goback often to each of them. All of the cards are works of art. God bless to all who serve and to our wonderful veterans! Fabulous hop Sandy! I love that so many came together to support OWH and our heroes. I don't think I could pick ONE favorite. But I did like that a lot of cards had such a homey feel to them. I'm so inspired. Thanks for all you do! Loving your beautiful card thank you for the companies that participated. Believe it or not, this hop choked me up a few times. One DT member shared a saying about how our freedom was and continues to be hard fought for. I know so many who have or are serving right now that I get emotional thinking about them and how much I love my country. Thanks for all you do to support our military and their families. Wow, what a great hop. So much inspiration from each of the participants. So many beautiful cards have been made by these firms. I can't wait to get started today with my friend to make cards for OWH. Loved the inspiration on here and I had a hard time not wanting to sit and personally go and start writing each of our members that are serving. making cards now to inspire them and thank them for their service. SO MANY really awesome cards and new ideas. Excellent job all the way around! Sandy and your team THANK YOU for putting together an amazing organization and an inspiring hop. I am privileged to be an OWH cardmaker!! So much incredible inspiration in this hop! I predict a weekend buried in ink and paper and ribbon for me 🙂 Thank you to all the participating companies!! What a fun hop and what wonderful companies to support OWH! I have added a lot to my google reader! I did see some new products and cpompanies along the way- Tonic for one! Thanks Sandy for ALL you do. Awesome to see all these companies supporting our heroes! This was such a great way to begin the day! I am so inspired by all the beauties throughout the blog hop! And I also realized I have been such a wasteful person; Instead of throwing little scraps away, I should be making cards for OWH. Its so simple, but it makes such huge difference! I loved following the blog hop today…so much inspiration. Hero Arts, SRM Stickers and May Arts were my favorites. Think I'll be sure to invest in some SRM stickers and maybe a Sizzix after this!!! Oh my the preima cards were stunning, the copic tutorial makes me want to get their airbrush and a refill for my blender pen and all the great cards begging to be CASE'ed. What a great day. Hope it won't cause too much issue my name changed on the blog hop from Amber Cirillo Holcomb to AmberSkye. Hero arts didn't have the google link. I just finished hopping to all the blogs and wow… they were all so wonderful. I had a favorite when I was at the Ranger blog with Tim's fabulous Red, White and Blue cards.. oh my they were so awesome. Then I got to the May Arts blog and seen a Thank You Hero card with a toy soldier stamped on it and I was just mesmerized.. that card is so rockin' that I wish I had the supplies to recreate it.. now, right now. Thank you to all the companies that participated in this blog hop.. I had so much fun getting to ooohhhh and aahhhh over all the beautiful card samples. Your support means the world. Thank you.Happy Veteran's Day to all the Veteran's out there.. God bless each and every one of you. Thank you to ALL the OWHer's who make cards to send in, to those who donate to help with costs, as an Army wife, daughter and sister and an Air Force Mom, I must tell you that my heart swells with pride with all the love and kindness that each of you show with what you do for our military, God bless you all.blessings ~ Pam T.
Great blog hop! I really enjoyed it! I was unable to comment on the Sizzix blog, but I got everybody else! thanks to everyone who participated in this great cause! thanks also for all the inspiration! What a fabulous blog hop! Oh my! Where to start. I loved each one and think each inspired me with wonderful ideas and product! I'm pretty excited to have a go using my Copic Air Brush to create cards like what I saw on the Copic blog post. Thanks to all of the sponsors and the designers for this. It was awesome!! What a lot of great inspiration. Thanks for all you do at OWH! IT's an honor to be a part of it all. Being a veteran's wife, I can't thank you enough for all you do. And thank you to all of the corporate partners for today's delightful hop! What an amazing hop! I am so inspired right now…I'm off to make some cards to place in my OWH box! Wow, so many amazing cards on this blog hop. I've got a few bookmarked to save as inspiration. I loved the whole blog hop. Such inspiration and such creativity from these designers. I especially liked Ranger because of the bold colors. I liked May Arts also. 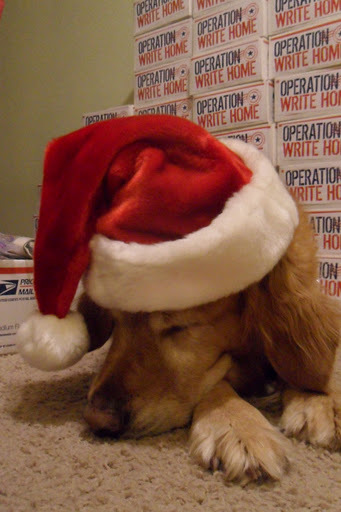 Thanks Sandy and Operation Write Home for the blog hop today! A great hop for a great cause! I am inspired by the work of so many designers. There is so much talent! Wow! These cards are wonderful, and I'm so inspired by the outpouring of talent and participation by this community. This is a great cause! So many wonderful cards! I've gotten lots of ideas to work on in the future. After watching the tutorial for the Sew Ribbon, it is now on my wish list. I love using ribbon, and this would give me some different way to use it. Thank you for the inspirational blog hop. What a wonderful hop! I found you guys through SRM Stickers last year and I'm a big fan! The projects on all the stops were awesome, but I was really impressed with the selection and tutorial on the May Arts blog! Such beautiful cards in the hop! I am so thankful for what you do! Being a military spouse, it is so nice to see that others support our families and those who serve. Thank you, and thanks to all the volunteers that do their part in helping. I am hoping to find some time to make some cards here in a few months. Thanks again! Awesome bloghop! Not only were there beautiful cards but also tutorials and such inspirational thoughts. What a great way to spend a part of my Veteran's Day. Thank you OWH for all you do. This blog hop has been so inspirational. So many awesome designers' work to view and hopeful CASE. It was just the right size too. Thank you, Sandy, for all of your hard work to set this up for us! Fantastic blog hop!! So much creativity along the way! Can't wait to try out a few new things! Thanks Sandy and OWH for such a fun hop! WOW–great hop; thanks so much for bring us this!! As for inspiration, WOW!!! If i had to pick just a few, and who can, I'd have to say Ranger and May Arts and Copic were my favs, with lots of others a close second. I went thru twice bc when I woke up, I needed ideas for a veteran I forgot to make a card for and I went to see this am. Tonight, I went back through and commented on them all. There is so much talent in this hop and it's truly amazing! Thank you for doing this for our brave men and women who have given so much. Fun Blog Hop. I'm heading back to SRM Stickers to see what else they offer. What an amazing hop! Such wonderful inspiration! Wow! There is not enough room to put enough "wow's" for all the inspiration I saw today! It took me a long time just to get off the Hero Arts page. I have got to learn how to make those leaves! (not all the sites let me leave comments, not sure why not) I loved them all! Thank you for putting this amazing hop together, now back to making cards! My head is spinning those all were wonderful. I will have to go back through again tomorrow. I fell in love with a peacock image on a card. Will have to find that image. Fantastic hop! So many beautiful cards. So much inspiration. This was a wonderful hop. So much inspiration. I hope we can do this again sometime. Happy Veteran's Day to all that have served and those still serving! Love the sites!! All the inspiration on this hop was amazing! There's so much talent out there! This hop was a great reminder that while we often craft for ourselves, the real pleasure is sharing our creative spirit. And the spirit of those brave men and women who serve our country runs strong and true. Thank you – and God Bless the veterans, those who serve, and their loving families who wait for them to return home! This has been a wonderful Hop! I didn't get to it until later this evening, but I am sure glad I didn't miss out! So much inspiration from so many great companies.THanks! I just finished the hope and feel so inspired to spend the weekend making cards 🙂 It was great to see so many varied designs for Thank You cards.Thanks to all the companies that participated and are supporting OWH! what a wonderful blog hop for the vets. it was wonderful to visit all the blogs. thank you for all you do. The bloghop was wonderful and for such a great cause!! There were so many inspirational cards. Thank you so much for another fun-filled blog hop. I enjoyed checking out all the participating sponsors and was inspired by the wonderful cards. There is so much talent out there and what a nice place to share it…OWH is amazing!! I love that these fantastic companies are all supporting OWH! I have two favourite things from the hop: (1) the Hero Arts – OWH collaboration for the new stamps. Hero Arts is my favorite company – they make terrific products, have the best customer service, and they DO all kinds of awesome stuff like this! (2) The beautiful message Jenni Bowlin wrote on her AnyHero card.Thanks for a great hop! And I've been very blessed lately, so please count me out of your generous envie giveaway! Wow, such a great hop filled with lots of inspiration and talent. I was especially inspired by Studio Calico and Prima. Thank you so much for organizing this wonderful hop and for your endless support for our troops. Happy Veteran's Day! Awesome blog hop! I'll be revisiting to see all the great inspiration again! I can't wait to see the new stamps from Hero Arts! Wow! So many beautiful cards. I plan to go back to some of the sites again. I love the use of stitching and want to try some of these techniques. Great fun! So many beautiful & amazing cards! Tons of inspiration! Fabulous cards. LOVED them and enjoyed learning a few new techniques from the fabulous designers. Gorgeous cards! So much work goes into themThanks you all for sharing. This was great fun. I learned a lot and can not wait to try out all the new ideas i have seen. Thank you! So many cards, and such wonderful inspiration! I loved all the cards on the Sizzix blog, and Heidi Kelley's card from the Prima blog, but I think my favorite card, and most inspiring, was the card by Shari Carroll on the Hero Arts blog. I love everything about it! Wow–overwhelming all the inspiration from these wonderful companies! My brain is full! This was a terrific hop! Many thanks too all the companies for all the awesome cards! Wow, what a great hop. The cards are all so beautiful. OWH is a wonderful organization. Thanks for all you do for our brave troops. What can I say, when you go to the pros…WOW. Everyone, no matter what your skill level, could find inspiration on the various sites. I could never pick a favorite, such variety. Great blog hop, so nice that the companies all came on board to do this. Wow–some really neat ideas. Every time I found a "favorite" I found another to fit the "favorite" catagory! Great work everyone! Amazing cards on each and every blog. I would be hard pressed to choose a favorite. Thanks to all for supporting our troops. Great hop! I was so happy to see everyone celebrating Veteran's day and making the lovely cards for our Heroes. I was inspired to do a post on my blog. http://dreamingncreating.blogspot.com/2011/11/veterans-day-celebration.htmlthanks for all your work. Sandy, thanks for supporting our veterans, old and new. Thanks for getting all the companies together. This is a great blog hop with lots of ideas. I've been looking forward to this all month long, and it was worth the wait. Oh my gosh, I couldn't possibly pick a favorite from this hop! But I particularly loved Ranger's and Prima's cards and May Arts designers' comments about how they're so thankful for the troops. Wow, I'm going to be revisiting this Blog Hop again and again! Great hop! Thanks for organizing and all the best with OWH! Such a beautiful hop with such a wonderful cause – thank you!And, as for my favorite, I loved the HA cards. Simply gorgeous! This has been one of the most AWESOME, AMAZING and INSPIRING Blog Hops… each Design Teams creative imagination and talent explodes throughout the hop. Operation Write Home is very fortunate to have the opportunity to partner with such great companies. Sandy you and Operation Write Home ROCK. Most of all THANKS to our TROOPS PAST & PRESENT they are the TRUE HEROS! Loved the Blog Hop and inspired to by the beautiful work. I can not wait for Hero Arts to come out with the new OWH stamps. I do not buy clear stamps but it is totally worth it for OWH. Also I was unable to leave comments on Sizzix and SRM Stickers. Both had lovely cards. Also unable to access the Copic Blog at all. Maya Arts impressed me the most, I'm gonna head back over there as I loved all the different styles, especially like how they made cards that masculine men won't mind using also… And I like that HA created 3 stamp sets just for this kinda thing. How awesome! Thanks for the inspiration. So many beautiful cards; many inspirations for future cards! Planning on ordering stickers from SRM and will go back to order the OWH stamps from Hero. Thanks for organizing the hop and for all you do for our troops. Wonderful hop! Great eye candy! Thanks for all the inspiration! This hop was just marvelous! Talk about major amounts of inspiration! Many thanks to all the participating sponsors for being such dedicated supporters of OWH. wonderful blog hop, loved it. so many inspiring creations. anyone receiving any of these cards will be love them. Thank you for an amazing hop. I really enjoyed the blog hop and have gotten some great ideas. Thank you to all these companies for participating and supporting OWH and our soldiers. Thanks for a wonderful Hop! I wish I had time to make some cards!My favorite technique has to be the Patti Splat from the Ranger blog. I also loved all the cards that had tags on them. I participated in a tag swap recently and have been looking for ways to incorporate them into cards. All of the vendors had such awesome cards…and nice comments too. Soooooo much inspiration for us!!! Thanks to all of them for supporting OWH and our military and for sharing their talents with us!!! Love this blog hop. My favorite product are the topic markers – Thank you Copic for your participation.The company I was least familiar with is May Arts – what gorgeous ribbons! Thanks for so much inspiration in one Hop! What beautiful cards, and wonderful ideas. I am certainly making a list. Thanks to all the sponsors who participated. Thank you for a wonderful and inspiring blog hop! such inspiring cards! Loved all of them but especially the Tonic edgers and that Copic shadow tree with the ribbon. LOTS of inspiration and I bookmarked the sites. Thanks Sandy and the 11 amazing companies! I am very impressed with the number and caliber of vendors who participated in the blog hop. All of the cards were stunning and I saw many that I will have to CASE. May Arts was new to me but since seeing their ribbons, I will need to check them out a bit more. I use all of the other vendors' products already and adding another supporter of OWH to my stash just seems like the right thing to do. Thanks you very much for the blog hop and all the inspirational cards and inspiration to continue to "thank" are military men and women. I found out about the Blog Hop from the Hero Arts blog. When I saw the OWH Blog Hop only had 11 participants I though this would be one blog hop I could hop through quickly. Boy was I wrong! Each stop along the way was filled with beautiful cards by many different designers. I knew of all of these companies. I already followed the blogs of quite a few but never realized some of them had blogs. But the blog I found most amazing was Stars and Stamps. What a great source of inspiration and encouragement to participate in such a wonderful way to honor our troups. I've already started working on cards. Bravo! What great hop participants. Lots of great ideas out there but the one that inspired me most was from Jen Jockisch at Studio Calico. The star is floating! I may be the last one to hop, but I was at a 4-day scrapbooking retreat where I collected 276 cards to send to Kris – mostly Love and masculine thank you cards! Hope I'm not too late to hop and win! This hop was the best. Thanks for getting this outstanding group of manufactors to participate. Each ones designers gave us loads of inspiration and made wonderful cards for our troops. It was nice of some of them to give prizes too.Thanks to you and your team for all you do to help our troops. You help us support them in a great way with OWH. So many wonderfully creative cards on this special blog hop this weekend! Thanks to all 11 companies for your incredible support of Operation Write Home. I'm so glad that I am a part of this organization and was able to participate in the hop to gain even more inspiration. Great blog hop and so inspiring, not only for all the beautiful cards but for the reason behind it all! I visited every blog or tried to but for some reason could not access the Copic Markers blog! Anyway it was amazing and I was so impressed with all the creativity and talent that I saw!